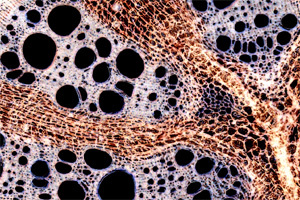 Vascular tissue of Aristolochia sipho. What are some of the features to look out for when purchasing a new set of biological microscopes? There are a range of different features that one should consider when purchasing a new microscope. Spring loaded objectives: Especially at high magnifications the working distance between the specimen and the objective can be the fraction of a millimeter. One careless rotation of the focus knob and it is possible to smash the objective into the specimen. This may result in the destruction of both the specimen (cheap) and the objective (expensive). In order to avoid such damage, manufacturers have introduced spring-loaded objectives. The lower part of the objective is flexibly installed and pushed in when contacting the specimen slide. Same series: If several microscopes are purchased, they should be of the same brand and make. This allows for an easier exchangeability of parts. Sooner or later different parts will have to be replaced and devices from the same manufacturer keep the costs down. X/Y Stage: For labwork, give a preference to systems that are equipped with an X/Y Stage and not clips. Moving of the slide by hand exerts pressure on the stage and this can result in a loss of focus. An X/Y stage allows the movement of the slide with two rotating knobs. X/Y stages should be equipped with a scale that simplifies the finding of relevant specimen parts. The slides can then be labeled with the coordinates for students to directly find the part of interest. Clips are useful for smaller microscopes used in fieldwork. Light, no mirror: Avoid the purchase of instruments that rely on natural lighting and a mirror. Sooner or later students will aim the mirror directly at the sun. This can cause irreversible eye-damage. Artificial lighting also makes the device independent of natural lighting and can therefore also be used in the evening time. Parfocal objectives: Parfocal optics allows for a change in magnification without the necessity of much refocusing. Make sure that the objectives are designed to work with each other in this respect. Parfocality is not automatically guaranteed. Focus block: I have seen some systems where even the low power objectives could be crashed into the specimen by careless focusing. I suppose that this is because of different manufacturers of objectives and the microscope. The microscope was, so I suppose, designed to accommodate a wide range of third-party objectives and there was not physical focusing block built in. In this case I recommend that the school purchases microscopes that allows for a manual setting of a focus block. Magnifications: I recommend the following objectives: 4x, 10x, 40x and possibly a 100x oil immersion objective. Again, make sure that they are of the same series and designed to work together. A 100x oil immersion objective is useful when cell division events are to be observed, mostly relevant for older students.